August 14, 2013 - Cessna Aircraft announced at the Latin American Business Aviation Convention and Exhibition (LABACE) in Sao Paulo, Brazil that the company has completed the first fuselage for its forthcoming mid-size business jet, the Citation Latitude. The Latitude prototype is expected to take its first flight in early 2014, and a mock-up of the aircraft is on display at this week’s LABACE show. The aircraft is expected to have a range of 2,500 nm, permitting non-stop travel between São Paulo and Caracas, Venezuela, or from Santiago, Chile to Bogotá, Columbia. Powered by twin Pratt & Whitney PW306D FADEC-controlled turbofan engines, the Latitude is expected to have a maximum cruise speed of 440 ktas. The aircraft will offer configurations for seating seven to nine passengers in a spacious, 1.83 m (6 ft) tall, flat-floored cabin. 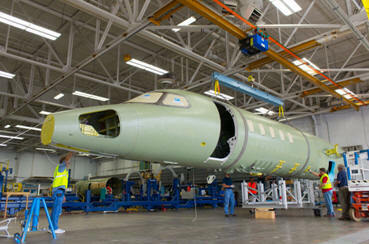 Development of the Citation Latitude is proceeding on schedule. The initial fuselage is complete and is being used as a static test article, while a second Latitude test article will soon be used for structural trials. The third article being built in the Latitude program will be the prototype aircraft. “We continue to make progress in developing the Latitude, which represents the next generation of mid-size business aircraft for the global market,” said Terry Shriner, Cessna business leader for the Citation Latitude.